Margaret Falk (you can call her Maggy), was born and raised in the El Fuerte area of Tucson, Arizona, and wrote her first book when she was just a child. ‘The Easter Egg’, both written and illustrated by Maggie, was scrawled in crayon on the back of her teacher father’s test papers. But writing wasn’t the first profession Maggie embarked on. Being somewhat of a decent singer, the opera beckoned. Luckily for her ever growing fan base, she returned to writing. Growing up in Tucson meant lots of farms and ranches. Among those was a little desert cemetery which haunted Maggies dreams. Maybe this is why her love for horror was so great. A huge fan of Stephen King, The Shining was the inspiration behind her starting to write horror herself. In 1990, Maggie sold her first book to Kensington Publishing Corp. 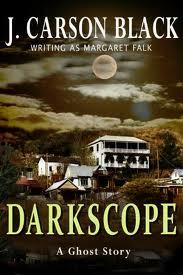 Being a huge Stephen King fan, and inspired by the novel The Shining’, it’s no surprise Darkscope was a ghost story set in the historic mining town of Bisbee, Arizona. But, even though Maggie went on to publish a further six books with New York publishers Kensington and Dorchester, payments were poor; amounting to no more than $3,500 per book. In 2002, Maggie wrote her first crime thriller. Darkness on The Edge Of Town was the first of three Laura Cardinal books. She contacted a previous editor, who’d moved to New American Library, and who loved the book. Maggie signed a two book deal, changed her name, and received a deal worth eightneen times more than the her last $3,500. J.Carson Black was born. When Maggie wrote The Shop, her agent, Debora Schneider shopped it to every publisher available. Two and a half years later and each one had declined. In 2010, Maggie decided enough was enough and with the blessing of her agent, decided to self publish. Darkness On The Edge Of Town was listed in June – and sold only one book. The following month, two books were purchased. It took eight months to hit sales of 100; with 137 in February 2011. Then things began to change. In March sales hit 1,280, and in April, she sold a staggering 10,000 books. If this wasn’t enough to make her scream with joy, in May sales hit more than 70,000 books. She was selling at a rate of 2,000 books a day. Now Amazon’s mystery and thriller imprint, Thomas & Mercer, has signed J. Carson Black to their growing team of authors. 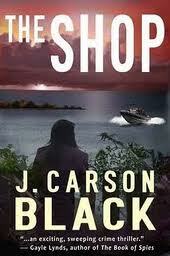 To date (November 2011), J. Carson Black has sold over 300,000+ copies. The Shop is due to be re-released by Thomas & Mercer December 22nd. Hmmm, after this rise to fame, what would Maggie make of our ten questions? Thanks, Donna! That was a lot of fun. Glad you got my answers in print—of course after the fact, there was a lot of second-guessing! Wow! What a story. This is the kind of thing us hopefuls feed on. Congratulations, Maggy. Thank you for talking with Donna today, and thank you, Donna, for telling us more about J. Carson Black. Piper, this woman is amazing. Her backstory could be one of my characters! Shellie, it wil be you one day. Are you considering self-publishing or the traditional route? So, you’re one of those, “leave it to others to do my marketing” kind of people. NOOOOOT. How inspiring that you kept the faith in your story and kicked some major @$$. Awesome. Thanks for doing the interview, Donna. Off to add your book to my Xmas list, Maggie. Which one you going to download, Kerry? That’s the one I’m going to start with, too….as soon as I get my new Kindle on Christmas day! Hi Donna, another great 30s (not even on treadmill this time). Congrats Maggie, you’ve got a great story and a great name in J Carson Black. Least favorite word, patriot? There’s got to be a story behind that one! Not on the treadmill? You lazy wotsit. Thanks, Donna, for doing this interview! It’s good to meet Maggy this way and be inspired by her impressive success story. Nice work! Thanks, Donna – and thanks to everyone for posting. What a wonderful surprise to see so much interest in my story. Which is not unique, by the way. Two of my closest friends – I’ve known them for years – have done exceedingly well with ebooks. And like me, it took them months, more than half a year, to get traction. So write the best books you can and keep the faith. Keep writing and adding more books, and be in it for the long haul.